The year and country of discovery are taken from Wikipedia and are based on when the element was first observed or predicted rather than when it was first isolated. The priority for the discoveries is often contentious. The visualisation uses the listings currently in the Wikipedia article, with no claim as to their accuracy. The country is typically both the citizenship of the discoverer and the location of discovery. Exceptions include Hafnium (discovered by a Dutch and Hungarian duo in Copenhagen) and Radon (discovered by a British and American duo in Montreal); these are listed under location. Countries and flags are of the modern equivalents when appropriate: e.g. Russia rather than the USSR, UK rather than England/Scotland, and Mexico rather than New Spain. The etymologies are also taken from Wikipedia. The legends contain summary counts of the data. Good work, Sweden. 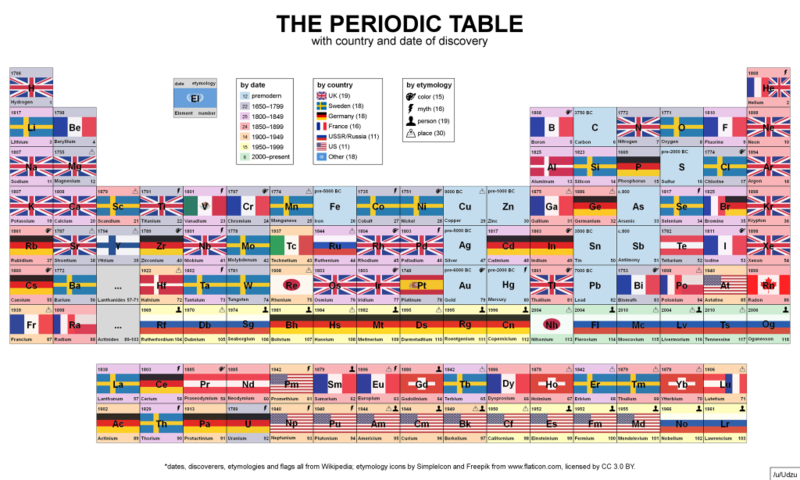 Ranked in order, the UK could lay claim to 19 elements, Sweden and Germany to 18 each, France to 16, and Russia and the United States to 11 each.